The final three bask in their glory, before turning their attention back to the game. Steve knows Vanessa made a final two deal with Liz, though Vanessa denies it vehemently like all her lies. Liz is sure Vanessa will take her to the final two since they've had a tight bond, but Steve also wants to bring Liz since she'd be easier to beat than Vanessa. Then they reminiscence about times of Big Brother 17 yesteryear to create a clip show that I fast forwarded through. The final Head of Household competition is played in three parts, with the winners of round one and two advancing to the live final competition at the finale. 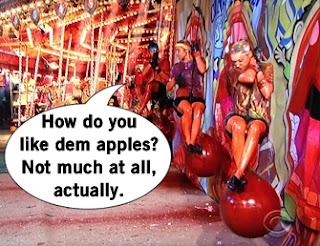 The first competition has the houseguests hanging on big fake apples over a pool of red "candy" that looks like a horror movie bloodbath. Of course the apples have to swing across the yard and slam the houseguests into a foam wall and constantly dip them into the blood candy. This looks like a carnival sacrifice on American Horror Story: Freak House. Vanessa wins part one after nagging Liz to death to drop and making a deal, which means Steve and Liz will compete in part two. The second HOH competition is trivia mixed with physical, traversing a giant wall to fill out a Big Brother crossword puzzle. In case you're wondering, of course I nailed it with answers. Steve finishes the crossword three minutes faster than Liz, which means he moves along to the final comp against Vanessa. 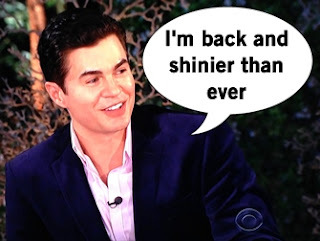 BUT FIRST, legendary Big Brother player and Botox enthusiast Dr. Will Kirby corals the jury together to hash out the potential finalists. Many are bitter, while a few can see deserving players and moves. Austin is all sour grapes on Vanessa and can't believe his love Liz still trusts her. Every single jury member admits they were eliminated due to Vanessa. James and Shelley give Vanessa respect because she has been strategic all summer, but Meg reminds everyone that the whole house was onto Vanessa they just let her get away with it. Indeed you fools did. However many dislike Vanessa's integrity and exaggerated deals. Steve is credited for winning comps when needed and throwing when it wasn't, not to mention being social in his own way. But Johnny Mac feels others shielded Steve the whole game. 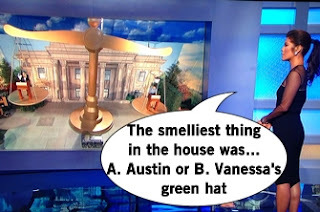 Liz is praised for surviving the Twin Twist and being good at competitions, but many felt she was moreso a duo with Austin (or Julia but even if the jury she's a non-entity). Should be an interesting vote at the final two... maybe. 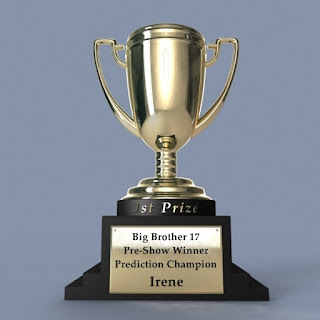 Everything comes down to the live final HOH competition, the usual "Scales of Just Us" trivia competition to finish sentences answered by evicted jury members. It's a head-to-head battle for who will guarantee their final two spot and pick who joins them. Vanessa and Steve both want to take Liz to the end since she'd be easier to beat, yet both confident/arrogant enough to believe they'd take each other. 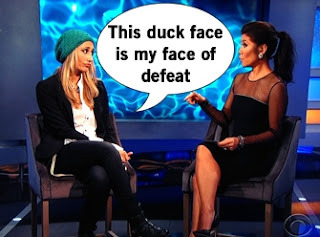 Steve beats Vanessa 5-4, which makes sense since Steve would actually know/understand personal answers people might give as opposed to Vanessa who pretty much only talked game. While Vanessa was his ally all game, Steve isn't an idiot and evicts Vanessa and brings Liz to the final two. Vanessa compresses her rage but you can feel the tension through the screen. One competition lost her the whole game, the game she controlled all summer. Vanessa may have irritated me to no end, and honestly removed a lot of the fun from the game, but she definitely would have deserved the title. 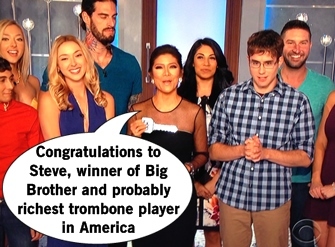 But that's not the ending, and either Steve or Liz will be the champion of Big Brother 17. The jury is brought on-stage to interrogate Steve and Liz to help decide which deserves the half million dollar prize. Right off the bat, the jury is super impressed that Steve had the balls to evict Vanessa. After a couple awkward audio problems on live television, Steve is really able to articulate his game and strategy, joining and being shielded by the Scamper Squad. Steve insists he was not a floater, being in alliances with several people and winning competitions when necessary. Liz is blissfully unprepared, which is crazy since she knew Vanessa was planning to take her. Her self-cited biggest move was aligning with strong people. along with winning comps. So yeah, even with slight stammering Steve definitely had the better answers and way better closing speech. The jurors cast their votes to win, then the show fills 10 minutes by bringing the pre-jury houseguests back to talk about life after the show and Vanessa admits she is a pro poker player. At last the keys are pulled to reveal the winner and Steve is crowned the winner of Big Brother 17. The other big shocker of the night: James was able to beat Johnny Mac for America's Favorite Houseguest. Expect the unexpected! Well everyone it's been another fun summer with you all and I'll see you again next summer. Though in the meantime you can read my other show recaps, like the newly started Survivor: Cambodia - Second Chance. Most importantly, we've got some trophies to hand out. Three people chose Steve as their Pre-Show Winner Prediction. I don't have their Twitter names, but congratulations to you all - your [picture of a] trophy is below!